A fence is not only a construction for the safety of people, but also a stylistic addition that gives beauty and a finished look to a summer cottage. There is a huge variety of fences. However, choosing a design that meets the needs is sometimes difficult. If you want your summer cottage to look modern, without spending much effort on the arrangement of the territory, and at the same time have a small sum of money, the garden net is the best option. How to choose a garden mesh for the fence? What should be considered when deciding on a purchase? We hope this article will fully answer the questions raised. 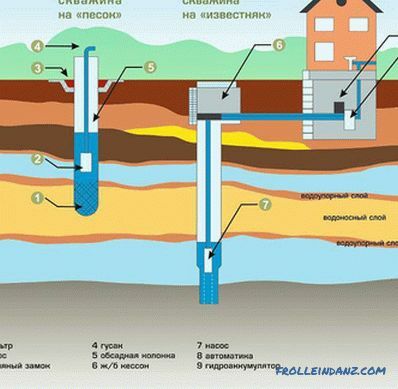 Low weight, which greatly facilitates the process of transportation. So, on average, a roll (coil) weighs 6-8 kg and has a length of 20-100 m. (For comparison, the steel equivalent of a net weighs more than 23 kg). The installation process is quite simple, which is why you can use this fence both permanent and temporary - portable. 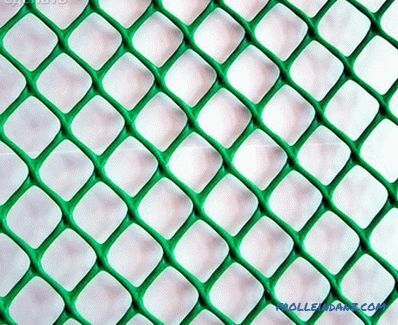 A wide range of garden mesh. Manufacturers make a grid of different colors with different cell sizes, width and height, which allows you to tailor designs for any needs. Does not corrode or rot. Polymer mesh does not need to be covered with antiseptic protective agents. Durable. 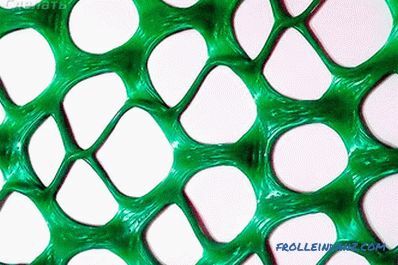 Plastic garden mesh will last you at least 50 years. It is able to withstand heavy loads and does not lose properties at temperatures from -60 ° C to + 80 ° C.
During operation, the grid does not change color and does not heat up, since these products have a high level of resistance to UF radiation and are characterized by a low thermal conductivity. Made from environmentally friendly and safe raw materials. Easy care. No need to paint and handle all sorts of means, and any dirt can be removed with plain warm water from a hose. As a result of the absence of metal in its composition, this type of fence does not interfere with the passage of radio waves and the unobstructed reception of radio and television programs is possible. Low cost, which makes it affordable for families with different income levels. As a rule, the price of a garden mesh of polymers is at least 5 times lower than the price of its metal counterpart. Relative strength. 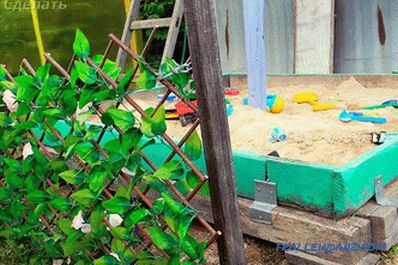 Polymer mesh fence is not able to protect against intruders, because polymer mesh threads are easily cut. Transparency of the fence. Such a fence will not save the yard from prying eyes, strong gusty wind and dust. To install a plastic mesh fence you will not need any special equipment. As a support, you can use wooden or metal beams, installed at a distance of 2-3 m from each other. It is possible to attach the net to the beams using plastic or metal clamps or wire, and the net itself can be easily cut into pieces of the required size with ordinary shears (shears). In order to strengthen the structure, it is desirable to hold the wire along the upper and lower edges of the trimmed canvas garden mesh. Due to its low weight, one person can both assemble and dismantle the polymer mesh. It is not difficult to roll up the garden mesh of polymers into a roll and store until it is needed again. First of all, you need to decide what kind of fence you need: it will be a fence for fencing the entire backyard plot or a fence dividing the territory inside the plot into zones. It is worth noting that many experienced gardeners are engaged in zoning only in order to protect plants from adverse conditions. And someone just wants to distinguish the garden area from the recreation area, etc. Then you need to think about how high your fence will be, and measure the size of the territory you are going to fence. These parameters are very important, since they will have to be based on choosing a roll or rolls of garden mesh with appropriate dimensions (meaning the length and width of the roll). If you want to decorate the territory of the intended fence, then at this stage you must decide whether the fence will be a boring construction or climbing plants will create a shade and give the site a beautiful, complete look.And also here you have the opportunity to decide on the coloring of the desired fence: whether it will be standard green, khaki, or another shade that suits you (for example, you can buy a grid in the color of a metal - a silvery shade, and you can choose orange, black, white or red). The cost of plastic nets is influenced not only by the weight and cost of raw materials from polymers, but also by the cost of copolymers and dyes. Because Garden nets made of polymers are used for different types of fencing, there is a little trick in relation to the choice of cell size. The grid with large cells is an ideal solution for the fence enclosing the entire household plot. 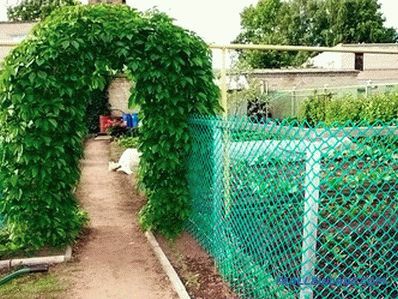 In addition, it is used for fencing shrubs, areas for games, tennis courts, swimming pools, as well as for the separation of garden paths, arrangement of flower beds and garden beds. With the help of a grid with large cells, your fence can easily turn into a hedge. 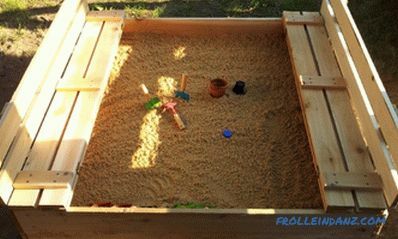 This mesh will serve as support for the folding and climbing plants. For example, ivy, climbing roses, clematis, ornamental grapes and others. But the garden grid with small cells is recommended to use for fencing the territory of chicken coops and other enclosures with small animals. 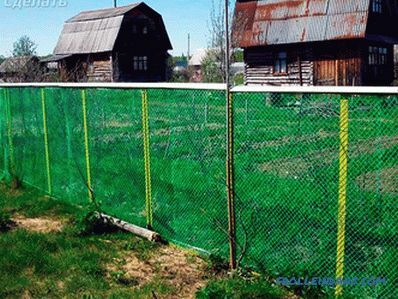 For fencing the territory of the summer cottage, the most suitable option is the F-50 plastic garden grid with large cells. When choosing a plastic mesh for the fence, you can get confused without knowing what to prefer - products of world leaders or products of domestic manufacturers. To date, the plastic mesh from world leaders such as Tensar (USA), Conwed Plastics (USA or Belgium) and Tenax (Italy) has proven itself well. 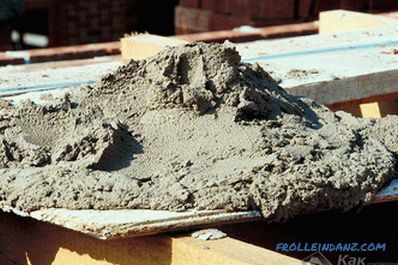 For example, from a wide range of Tenax products (Italy), you can pay attention to the Millennium gray grid (cell size 34 * 48 mm), which is a good alternative to metal grids and is particularly durable due to special technology production using the process of molecular orientation of polymer fibers in two axes. This grid is used both for zoning the backyard plot, and for building open-air cages or pens for animals and birds. fences from sand and snow sediments optimally can be applied Tenax laminated grid "Griffin" (cell size 60 * 45 mm), distinguished by its flexibility and durability. 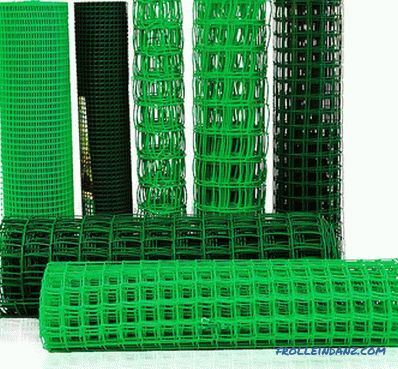 Fence nets produced by domestic manufacturers, such as Stren, Lepse, Project (Slavros), are in no way inferior in quality and range to their imported counterparts, gaining increasing popularity in the market. To whom or what to give preference - each decides individually, based on their desires and capabilities. 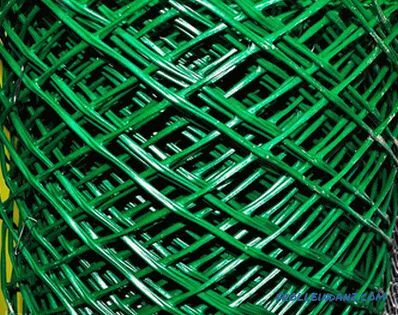 If you have some experience in this matter and wish to supplement the article with your own tips on how to choose a garden net, please write comments.